Those of you kind enough to read this essay might already know a secret I have lived with most of my life. There is another Lee Hurley in this town. How do I know? Because I have been asked at least 150 times, "Are you THE Lee Hurley?" The first time this occurred, way back when, I assumed it was yet another fan that knew I was voted "Most Popular" in junior high along with Debra Shelton. The race for "Most Popular" that year was brutal, the ramifications obvious. Sam Nakos, son of a well-loved restaurateur, had been voted "Friendliest" earlier in his career and was aggressively campaigning for the next level of "Most Popular." Sam fought hard and clean, yet I was able to defeat him with the simple strategy of being a better guy. It wasn't easy. My payback was just around the corner. There was a Lee Hurley, better known, and more significant than me. To explain THE Lee Hurley in terms of an analogy, I would have to say that THE Lee Hurley is to car engines as THE Bear Bryant is to Alabama football. If you are serious about high performance engines in this town, you probably know THE Lee Hurley and his shop HESCO or you will, at some point. This may sound like an advertisement and it is true that I happen to care about THE Lee Hurley and his family (Martha Jo, Beverly and Connie), but that has nothing to do with the fact that doctors, lawyers, CEOs and NASCAR officials have all expressed great respect for me in thinking I was THE Lee Hurley. Being mistaken for THE Lee Hurley had other advantages. I would drop my car off at the dealership and the mechanics thought THE Lee Hurley was conducting a test. I got excellent service at a fair price. People asked me what it was like to have my own radio show, to fly airplanes, to be in the pits at NASCAR, to be an arm wrestling champion. Men asked me for advice, Moms asked me for help, I tried hard to be good-natured. I asked the Lord to make me a rock star. The Lord changed the subject. Only every once in a while did I actually pretend to be THE Lee Hurley, but I'd usually be exposed quicker than you can say "Automobile Engineer." All in all, I'm okay. It's a long shadow to walk in, but I could have done much worse. THE Lee Hurley has worked hard for the both of us. This article was published in the June/July 2004 issue of Portico. The article is written by Lee M. Hurley, Editor-in-Chief of Portico magazine. 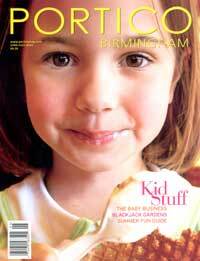 Portico is a Birmingham, Alabama magazine. Click on the picture for more information about the magazine.